Brent crude oil priced in euros hit a new high closing price today of €94.83/barrel, exceeding the highs reached in 08 as well as early this year. 1. The euro is down close to 15% over the past year. 2. Draghi's "Believe me, it will be enough" statement increased demand for "risk assets". 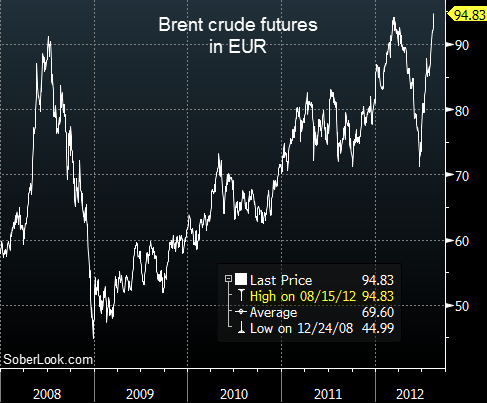 Bets on additional central bank stimulus are pushing up crude prices. 3. An unexpected decline in US crude and gasoline inventories added to the upward pressure on crude. 4. Israel's rhetoric on Iran is not helping matters either (particularly when it emanates from official sources). With tighter US supplies, it doesn't take much to spook jittery oil traders. The "Iran premium" currently built into the crude prices is not insignificant. Bloomberg/BW: - Israel would be willing to strike Iran’s nuclear facilities, even if doing so only delayed its ability to produce nuclear weapons for a few years, Israeli Ambassador to the U.S. Michael Oren said. Israeli leaders have stressed this month that time is running out for a diplomatic solution to the nuclear program that Israel regards as an existential threat. As discussed before, these elevated fuel prices (based in EUR) will inflict serious damage to growth prospects for Eurozone nations - particularly for Italy who is already struggling with a year-long economic contraction.